The Diamond antenna HFV-330 is a motor controlled dipole with compact dimensions. Built-in at the base point of each radiator is a motor driven coil that can be operated remotely. This way the dipole can always be perfectly adjusted while comfortably sitting indoors at the radio. The dipole is set up as a V-dipole with 90° angle and has a very small turning radius of only 1.8m. The emitter elements have a length of max. 2.53m. 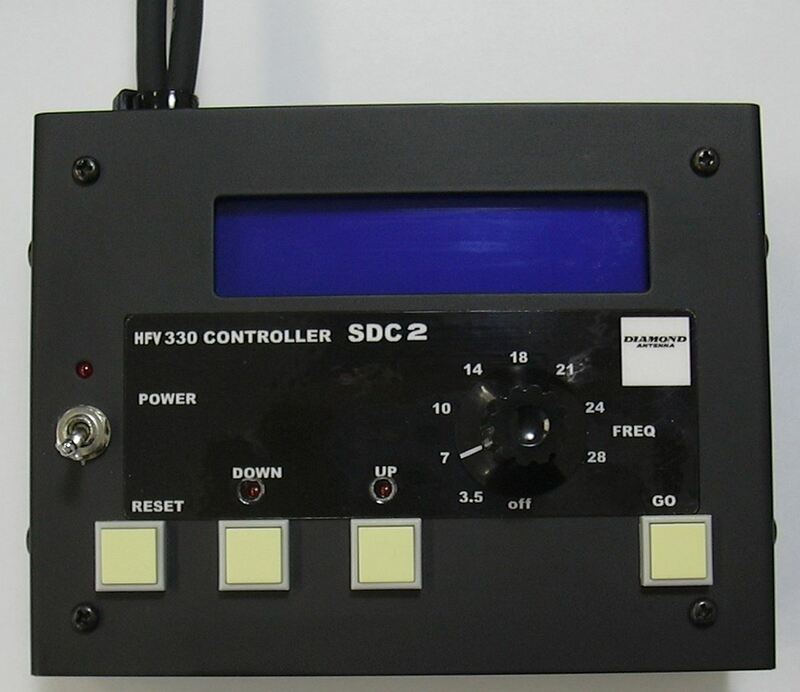 Delivery of the Diamond HFV-330 antenna includes the control unit SDC-2. This control unit is used to adjust both coils of the dipoles. A memory location exists for each amateur radio band, from this position the resonance is fine tuned for the operating frequency. This way a SWR of 1.5:1 on the entire frequency range is accomplished. When tuning the length of the radiators do not change, only the internal tap of the coil is moved by the motor. This makes the antenna mechanically robust, regular maintenance is not necessary. Depending on the length of the radiator elements used the HFV-330 can be adjusted either from 3.5 to 25 MHz or 21 to 30 MHz. The included radiator elements can be adjusted to the different lengths. The included control cable is 15m long, the control unit SDC-2 requires operating voltage of 12V (max. 300mA). The HFV-330 dipole antenna weights about 5.9kg, the included mounting plate allows installation at masts with a diameter of 38 to 60mm. Compact and lightweight portable antenna for shortwave 7 to 52 MHz. The antenna is tuned by moving the tap on the inner coil up and down. This assures a perfect match and a good efficiency of this antenna. Ideal for vacation and portable HF activities. Transport length only 40cm, max. length 178cm. Max. power load up to 120W, weight only 285g, connector BNC plug. For radios with PL socket we recommend the angular PL/BNC adaptor , article 42360.